"So let's say you're among the multitude who have bought that shiny new iMac or Mac Pro in recent months. Now what do you with that old G4 or G5 Mac? You could donate, recycle, or sell it, of course, though that last option is unlikely to fetch you a tidy sum in return. "But instead of retiring that old Mac, why not try to squeeze a few more years of service out of it? Macworld has covered this subject before - here are links to the 2007 and 2005 collections of new tricks for old Macs - but I've put together a list of things that creative professional can do with their old machines. In some cases, you'll have to spend some extra money for a new display, and you'll have to make room somewhere in the home or office for your extra Mac. But in my opinion, it's worth the effort or few extra bucks." "Don't look now but Apple Mac hardware and the accompanying OS X 10.x operating system software are gaining significant momentum among corporate users. "A new, independent Yankee Group web-based survey of 750 global IT administrators and C-level executives found that nearly four out of five businesses - approximately 80% - have Macs and the OS X operating system installed in their networks. And although the Apple Mac hardware and OS X operating systems still represent a small niche, adoption and acceptance of Mac hardware and operating system software are growing at a steady and sustained pace not seen since the late 1980s." "Although the types of tech writing that I do require me to spend the majority of my time on Windows PCs (and some on Linux systems), I also use a MacBook, and have accumulated a list of Windows-vs.-Mac gripes over the years. I know that a lot of readers of this blog use Macs, but quite a few use Windows machines, too. If you're considering switching to the Mac - and more people are than ever - here is my top five list of advantages the Mac offers. "Mac users, what would you add to this list?" "Potential switchers need to realize that Mac OS X although similar in some respects to Windows, works differently. At the most basic level Mac OS X and Windows are similar in that they offer users a graphical user interface (GUI), point and click with a mouse, folders, windows, applications/programs to perform essential tasks, and the ability to connect to peripherals. "At an operational level however, Mac OS X is very different from its Windows counterpart. Not only does it look different but it also operates and is architected differently. These key operational differences directly filter down to how the two operating systems interact with the user. Many first time Mac users complain that it feels foreign and unnatural because they don't know how to accomplish tasks, or use an application. This is simply a byproduct of having used Windows for so many years. New Mac users will have to go through a learning curve, there's no way around this fact." "After more than 20 years of being a PC user (including all versions of Windows and MS-DOS before that), I switched over to a MacBook Pro last October. It was not an easy adjustment, and I seriously considered going back to my ThinkPad. Fortunately, I made it past that stage, love it now, and can't imagine ever using Windows (which needed to meditate for two minutes before even turning off) as my primary operating system again. Nonetheless, the first few weeks were rough, and the switch pretty much killed my productivity during that time. "Here are some of the software and operating system challenges I experienced, as well as how they were resolved. Hopefully some of this might be helpful to those who have recently made the switch or are considering it." "Whether you're writing a report, editing home movies and posting them to YouTube, or managing complex spreadsheets, you want to do it as quickly and easily as possible. But because we all develop our own habits for using a computer - maybe somebody showed us how to do things a certain way or we've figured them out on our own through trial and error - we don't always work in the most efficient or organized manner. "This is especially true when we're new to an operating system. And for new Mac users and longtimers alike, Mac OS X 10.5 Leopard is filled with new ways of getting things done. That's where these tips come in. They're all about learning to make better and more productive of use of what's already there. "One of the biggest computing productivity killers is having to pause to search through different windows and applications to find the one piece of data or button that you need. Keeping everything as organized and uncluttered as possible - and knowing how to navigate through applications and documents quickly - can cut out much of this frustration and downtime. "Enter Spaces, a feature introduced with Leopard that lets you create up to 16 virtual desktops. Each Space acts a discrete desktop, only displaying the windows that you open while in that Space or drag into the Space later (though every Space will display the Dock, menu bar and any desktop icons you have)." "After previous rumours of Apple including different, and possibly proprietary, chipsets in its next round of MacBooks, comes additional speculation regarding the future internals of Apple hardware. "Nvidia is to produce a a chipset compatible with the platform, that incorporates much superior graphics - ideal for the alleged native GPU support of OS X 10.6 - on only one chip. Intel provides two...."
PR: MacMod announces the beginning of the 5th annual "Great MacMod Challenge" sponsored by iFixit. MacMod is home to Apple Macintosh computer users who modify their computer and software, in sometimes extreme cases. The Great MacMod Challenge 2008 is the fifth of the annual event where computer "modders" submit their creations for a review by a panel of judges for over $2,000 worth of prizes. Each contestant is allowed to submit up to three mods and will be judged by a panel of influential Mac community members on the level of difficulty, creativity, integration, and functionality. The first thirty contestants will receive a gift set valued at over $90, including the Booq Venom Pulse bag, Speck See-Thru MacBook cover, and an iFixit multipurpose tool. All contestants get a commemorative Great MacMod Challenge 2008 T-shirt. The top three mods will be in the running for a great set of prize packages sponsored by iFixit, Griffin Technology, and Hosting Outfitters. All the essentials for your iPod from Griffin Technology. Winners will announced in September at MacMod and all entrees will be on display at the Great MacMod Challenge 2008 photo gallery at MacMod. MacMod is a community dedicated to providing Apple users with the resources they need to personalize, customize and modify their Apple products. The site, launched in 2004, features detailed mod guides, product reviews, forums and news feeds. It is also the home to the annual "Great MacMod Challenge" where contestants from around the world compete for the "Mac Mod of the Year" award. iFixit's goal is to empower people to do repairs themselves by giving them the knowledge, tools, and parts to do so. iFixit is the Mac+iPod do-it-yourself company. iFixit launched in 2003 and instantly became the leader in the Mac laptop part industry, and introduced iPod parts in 2006. iFixit is dedicated to helping people everywhere keep their Macs and iPods running longer. So far, iFixit has helped over 30,000 people repair their computers and iPods. For more information, visit their website or call 1-866-61-FIXIT. PR: Logitech has announced the perfect keyboard to complement your Mac computer. The Logitech diNovo Edge, Mac Edition, is the newest addition to Logitech's line of award-winning diNovo keyboards and the first diNovo keyboard specially designed for the Mac. "We're truly delighted to offer discerning Mac enthusiasts our highest quality in keyboard design and performance," said Denis Pavillard, vice president of product marketing for Logitech's keyboards and desktops. "From the piano-black finish to its built-in TouchDisc touch pad that allows you to scroll and navigate from your keyboard, and includes hyperfast scrolling so you can fly though long documents and Web pages. 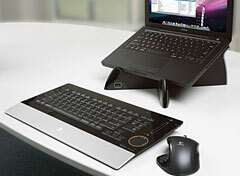 , the diNovo Edge can make it a pleasure for you to type, control music or launch your favorite applications." 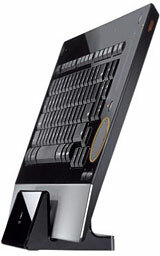 Since the introduction of the original diNovo Media Desktop in 2004, Logitech's diNovo line of distinctive keyboards has garnered many awards in response to its blend of design and performance. The newest diNovo keyboard laser cut from a single piece of Plexiglas and set in a brushed aluminum frame, is exceptionally thin (1Ú2 inch or 11.05 mm) with a high-gloss, semi-translucent Plexiglas frame, sharp angles and soft-orange backlighting. The aluminum palm rest with anodized-silver finish looks good with any Mac computer, including the iMac and the MacBook Pro. For a typing experience that's comfortable, fluid and silent, the new Logitech keyboard features the Logitech PerfectStroke key system. PerfectStroke is designed to create longer key travel - 3.2 mm compared to 2.2 mm - than that of typical notebook keyboards, which means that the distance your fingers have to travel to activate a key is optimized for your comfort. And because micro-scissors distribute force evenly across key surfaces, even if you strike the edge of a key, the key stroke still feels the same. An included charging base eliminates the hassle of changing batteries, with a four-hour charge giving you up to one month of battery life. A 10-minute power charge provides one day of use. 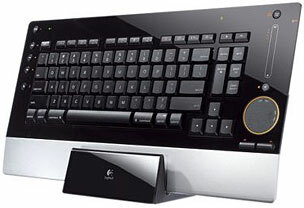 So you can get started right away, the new Logitech keyboard connects directly to a Mac computer through Bluetooth wireless technology, providing a range of up to 30 feet. 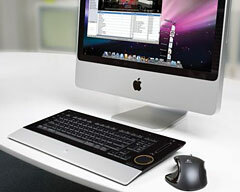 The Logitech diNovo Edge, Mac Edition cordless keyboard is expected to be available in the US beginning this month. The suggested retail price in the US is $159.99. PR: Newer Technology, Inc. (NewerTech), developer of PC, Macintosh, iPod, and iPhone performance upgrades and accessories, has announced the new miniStack v2.5 FireWire 400/USB 2.0 powered hub storage solution, a new addition to the award-winning NewerTech miniStack line of small footprint, high performance Plug & Play external powered hub storage solutions. NewerTech miniStack v2.5 is ideal for data intensive uses, such as Audio/Video editing, digital photography, MP3 music libraries, and high-speed back-up. Built for performance, it employs the latest generation Oxford 934 bridge chipset; a 7200 rpm Serial ATA (SATA) drive; up to 1.0 TB of storage capacity; and up to 32 MB of disk cache to quickly store and retrieve up to 1 million JPEG photos, 350,000 MP3 songs, or 500 DVD quality movies. miniStack v2.5 functions as a centralized desktop hub for connecting multiple digital devices, such as scanners, printers, memory card readers, digital cameras, and iPods, simultaneously and clutter-free. It features a unique ergonomic rear and side port configuration of three FireWire 400 (one uplink and two additional) and four USB 2.0 (one uplink and three additional) ports. With its interface flexibility and compact design, miniStack v2.5 is the ideal portable external hard drive storage solution to move among multiple Macintosh computers and laptops and virtually any Windows or Linux -based computer with a USB or FireWire port. The easy-to-use miniStack v2.5 is also perfect for booting your OS on any system with FireWire 400 or USB 2.0 boot-support. In addition, Mac users can add miniStack v2.5 to an Airport Extreme wireless network via USB to wirelessly share files, perform Time Machine backups, and share other devices, like printers. Plus, miniStack v2.5 is A/V rated for high-performance home entertainment systems and sharing content with Apple TV . miniStack v2.5 is available immediately in seven preconfigured models priced starting at $104.99 from NewerTech's exclusive distributor, Other World Computing, at www.macsales.com , as well as through the retail channel. PR: The VMware Fusion team announces VMware Fusion 2.0 Beta 2. This latest public beta, a free download, builds on VMware Fusion 2.0 Beta 1, adding the Unity 2.0 suite of Mac-Windows integration features, new ways to protect and manage your virtual machines with multiple snapshots, and a garage full of power tools for technical professionals. And as previously announced, VMware Fusion 2.0 will be a free downloadable upgrade for all VMware Fusion 1.x customers. As with Beta 1, VMware Fusion 2.0 Beta 2 brings dozens of new features and improvements to the most seamless way to run Windows on your Mac. Beta 2 takes to the next level the Mac-Windows integration first pioneered in VMware Fusion 1.0. New in Beta 2, share applications between Windows and Mac. Launch Mac files with Windows applications, and even set web, email, and other links to launch in either your Mac or Windows browser and email clients. Use VMware Fusion's Mirrored Folders to seamlessly map the contents of your Mac's Desktop, Documents, Music, and Pictures folders to show up in your Windows Desktop, My Documents, My Music, and My Pictures folders. Building on VMware Fusion 1.x's ability to take a single virtual machine snapshot, VMware Fusion 2 provides ever better ways to manage and control Windows on your Mac. New in Beta 2, take and manage multiple snapshots for each of your virtual machines, keeping checkpoints before you install new software to protect against potential issues. And extending multiple snapshots, VMware Fusion 2 offers an industry-first: AutoProtect, automatic, timed snapshots at half-hourly, hourly, or daily intervals. DirectX 9.0 Shader Model 2 3D acceleration gets more refined in Beta 2, meaning bigger and badder Windows games will run on a Mac, with no rebooting. VMware Fusion 2 really starts to show its datacenter and enterprise heritage with the addition of a slew of power user tools. Multiple Snapshots and the addition of Mac OS X Leopard Server virtual machines, make VMware Fusion a Mac IT pro's best friend. Also new in Beta 2, better Linux support, including support for Ubuntu Hardy Heron and Linux Unity view. Server Grade Power: With the addition of Mac OS X Leopard Server, VMware Fusion 2 now boasts support for all major server OSes, both 32 and 64-bit. Also new in Beta 2, add up to four virtual CPUs to your virtual machines and control virtual machines from the Command Line using VMrun. We encourage anyone interested in the latest and greatest to check out the the Beta 2 welcome page, watch the demo videos, and go grab the bits. Please note: Beta software can be prone to instability and bugs. Don't run Beta software in a mission-critical environment. The current production version of Fusion was last updated in late May, when VMware fixed several bugs and removed an earlier workaround no longer necessary after Apple updated Mac OS X to 10.5.3. PR: Ukelele is a Unicode keyboard layout editor for Mac OS X versions 10.2 and later. Beginning with version 10.2 (Jaguar), Mac OS X supports an XML-based format for keyboard layouts (.keylayout files). These may be installed by copying them to the Keyboard Layouts folder within /Library or ~/Library; then they are enabled via the Input tab of the International module within System Preferences. However, modifying keyboard layouts - let alone creating entirely new keyboard layouts, such as for a new script - by directly editing the XML text is tedious and error-prone. In addition to simple assignment of single character codes to keys, Ukelele can assign multiple-character strings and can create "dead keys", where a keystroke sets a new state that modifies the output of the following keystroke. For more information about Mac OS X keyboard layouts, as well as existing layouts available for download, see Input Resources. For some types of layout, particularly with large numbers of dead-key sequences, creating a layout with the text-based tool KeyLayoutMaker may be a useful alternative. Ukelele is written by John Brownie of SIL and is copyright ©2003-2008. This software is provided under SIL's standard freeware license. improves the behaviour, removing more states. Fixed a bug which occasionally made Ukelele crash when editing the terminator of a dead key state by double-clicking the dead key. Fixed a bug which caused a crash on quit after adding a new modifier combination. Fixed a bug which caused a crash when a dead key state had no terminator specified, usually when a keyboard layout has been edited outside Ukelele. Updated the resources list to reflect a changed URL. Fixed a bug that caused a crash when you tried to open a file that had illegal XML. Fixed a couple of places where strings were not properly encoded for XML, leading to a possibility of getting a file which was not legal XML, and therefore the system could not use the keyboard layout, and Ukelele could not open it again. A malformed file could cause a crash on save. This is fixed. When you change the script code, a random keyboard ID in the appropriate range is chosen. Also, new keyboards have a random keyboard ID. Updated the manual to include information on the correct ranges of IDs allowed for each of the different script types. Keyboard IDs may have more influence than is implied by Apple's documentation, but this is far from certain. Updated the help book a little to reflect changes in the program and in terminology used in the manual. Updated the Unicode system keyboard layouts to have all the current control keys having default output (they got missed in 1.8b6). PR: AOL Radio 2.0 powered by CBS Radio features over 200 stations spanning more than 25 genres of music plus 150+ CBS Radio stations from across the US. The new AOL Radio 2.0 beta was built on feedback from our users - the new interface is built for Apple Mac OS X Leopard. Tiger (Mac OS X 10.4.x) users can use AOL Radio web version. Currently supporting 10 presets with 5 available presets on the player window. Right-click or Control-click to set one of the 5 presets or you can go to the Controls menu item. Favorites & Local Channels panes will be available in a future beta release. AOL Radio 2.0 beta does not officially support narrowband connections, but will deliver low bitrate streams to dialup customers. Additional features will be released during the beta cycle. Please review Beta 101 on AOL Beta Central for more information on becoming a beta tester. Stay in touch with the AOL Mac Team by visiting the Mac@AOL Blog. PR: FilePhile was created with a very specific goal: to solve the person-to-person file transfer problem. What is the person-to-person file transfer problem? Well, have you ever wanted to send something large to a friend or colleague? First you try e-mail, but it's too big. Then you try a web-based service, but those cost too much, have size limits, use crummy browser-based HTTP file upload, or... well... maybe what you're sending is something confidential and you don't want to upload it to someone else's server. So then, if you or the other party is tech-savvy, you mess around with trying to forward ports, set up FTP servers, and so on. Finally you either cobble something together or give up and mail the person a disk. That's the person-to-person file transfer problem. FilePhile's goal is to solve it with a piece of software so easy to use that anyone can use it and that uses the Internet the way it was intended: transferring directly rather than through some third party. You see, it's called the Internet for a reason. Every point should be able to talk to every other point. You shouldn't have to upload your file to some third party just to send it to another peer on the network. What makes solving this problem hard? The prevalence of firewalls and network address translation. But we've worked hard (and will continue to work hard) to incorporate into FilePhile advanced networking techniques that get around that problem. Part of solving the file transfer problem is solving it for everyone. That's why FilePhile is written in Java: because Java makes it easy to port FilePhile to dozens of OS versions and platforms. Another part of solving the file transfer problem is solving it in a way that preserves privacy. There is an increasing number of web-based solutions for file transfer, but these involve uploading your private data to some third party server where it can be read, indexed, and data-mined by whomever runs the server (or breaks into it). We think that giving someone a file should be as private and secure as handing them something face to face. Finally, solving the file transfer problem means not having size limits. FilePhile has, for all practical purposes, none. You could theoretically send terabytes (1 TB = 1000 GB) of data with it... though this would take a very long time with most net connections. File transfer sizes are limited only by your network connectivity, not by FilePhile. Step 2: Download the FilePhile client for your operating system. Step 3: Install the client and set your account info in the preferences. Step 4: Transfer unlimited files of unlimited size with professional security, even when both parties are behind firewalls! Easy to Use: FilePhile is as easy to use as an instant messaging client. It's like an instant messaging client for files. Just add another FilePhile user to your buddy list and then drop a file or directory onto their e-mail address. That's it. Direct: Files go directly from your computer to the recipients, which is both faster and more secure. This is also why FilePhile can be free, since it means that we don't have to actually handle file data. Private and Secure: Absolutely private and secure, with professional-grade end-to-end encryption! We can't even see what you're transferring! Great for trade secrets, confidential presentations, medical data (HIPAA), legal documents, or anything else that must remain safe from prying eyes. Bullet Proof: Transfers just keep going and going, automatically resuming when temporary problems occur. Just send a file and forget about it! FilePhile recovers from crashes, reboots, sleep/wake, and even changes in network location. You can start a transfer at home, pack up your laptop, go somewhere else, and the transfer will resume when your laptop comes back online! Cross-Platform: Got friends or coworkers who use Windows, Linux, Macintosh, or even more obscure operating systems like FreeBSD? No problem! FilePhile can run on almost anything! Absolutely Free: The basic client is absolutely free, and a professional version with enterprise features is on the way. Free also means no nefarious hidden "costs." We don't sell e-mail addresses to junk mailers, bundle spyware with our product, or violate your privacy.